Installation & Licensing | ESRD | Engineering Software Research and Development, Inc. Installation & licensing of StressCheck® and other ESRD products is straightforward. It is recommended that users thoroughly read the below tips and best practices before installing ESRD products, or setting up a floating license server. The following tips and best practices ensure these steps are successful for your ESRD product(s). You must have Administrator Privileges in order to properly install StressCheck® or other ESRD products. Download the latest StressCheck® (or desired ESRD product) .msi file from the ESRD Resource Library. Note: you must be have Customer privileges to download ESRD products. If you do not yet have Customer privileges, and are an ESRD Customer or Trial Evaluator, you must Request Customer Access. Double-click the .msi to start the installation process. Follow the instructions to install the ESRD product. You may choose from Complete, Typical or Custom. Typically a reboot is not required. If you have a license file, or a license server is available, jump to tip #4. There are two methods for StressCheck® FLEXnet licensing. The first method is the machine HOST ID (Ethernet MAC address), the second method is the Disk ID (Disk Volume Serial Number). For floating licenses, ESRD requires the server HOST ID. Go to the “System Settings” tab and click “Save HOSTID Info to a File”. Open the file and copy the contents into the “Message” field of Request for ESRD Support. Complete the form and Submit. Open up a command prompt (cmd.exe). Type “ipconfig /all” and hit Enter. Locate the “Ethernet adapter Local Area Connection:” line, and then the “Physical Address” subline. Copy the 12-digit alphanumeric string into the “Message” field of Request for ESRD Support. Complete the form and Submit. Type “vol” and hit Enter. Copy the 8-digit alphanumeric Disk Volume Serial Number into the “Message” field of Request for ESRD Support. Complete the form and Submit. StressCheck® uses the FLEXnet license manager from Flexera. If you have not installed this product, you may download it from the ESRD Resource Library as a FLEXnet v11.5 zip package. Follow the instructions to install FLEXnet v11.5 on your server. If you are already using FLEXnet to manage licenses for other applications, you may simply append the license keys provided by ESRD, into your standard FLEXnet license file (usually license.dat) and re-read in LMTools. Alternatively, you may maintain separate license files for each application. For additional details concerning license serving options, consult the FLEXnet documentation or visit our Software FAQs page. If running StressCheck® or another ESRD product for the first time (or after having removed all StressCheck® licensing references), you will be prompted with the ‘Specify StressCheck® License Path’ dialogue. 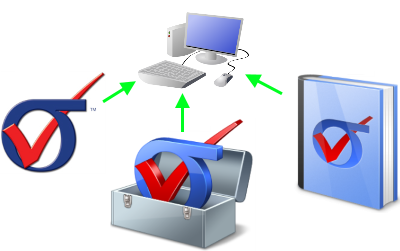 Where ‘PORT’ is the port used for communication (default is 29731), and ‘SERVERNAME’ is the name of the license server set up by your system administrator to serve licenses for StressCheck®. Then, click OK. StressCheck® should start once the dialogue steps are complete. If you are using a Node-Locked license, then do not check the checkbox and simply click OK. In the ensuing FLEXnet dialogue, you must select ‘Specify the License File’ and follow the instructions to specify the node-locked license file. StressCheck® should start once the dialogue steps are complete. Having Trouble Installing StressCheck® or another ESRD Product? If you are unable to run StressCheck®, or another ESRD product, successfully after installing a new license file, visit our Software FAQs page and review the FAQ’s. If you need assistance please contact ESRD Support.